Protect Pohakuloa! Stop the Bombing! POHAKULOA (BIVN) – Recent military training has riled island residents, and as activist Jim Albertini explains, the noise is only part of the problem. Just some of the many people who came out today to Protect Pohakuloa and stand for justice, peace and the earth! Mahalo to all! On Wednesday, March 29, 2017 people gathered outside the main gates of the 133,000-acre Military Pohakuloa Training Area (PTA), located in the center of Hawaii Island to stand for peace and protect sacred lands from further military bombing desecration and contamination. The group of protectors carried signs, offered Hawaiian chants, sang and prayed, as howitzer shells exploded in the distance, sending dust clouds high into the air. They also conducted radiation monitoring. 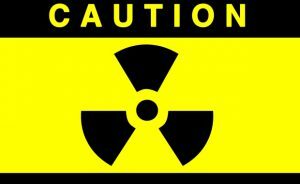 Depleted Uranium (DU) munitions have been used at Pohakuloa. The winds and continued use of high explosives can resuspend DU oxide dust particles which can then be inhaled. 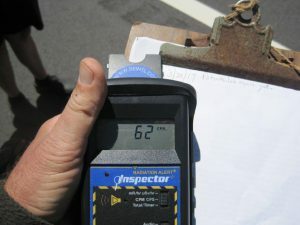 Dr. Lorrin Pang MD and retied Army Medical Corps, says “DU is an emitter of alpha radiation, the most dangerous form of radiation once it enters the body.” On March 29, 2017 protectors radiation monitors recorded spikes of radiation up to 70 CPM (counts per minute) outside the PTA main gate when normal background is 5 – 20CPM. Join the effort to protect people, plants and animals, land, air, and water – from Mauna Kea, to Standing Rock, to Pohakuloa. It is all one. 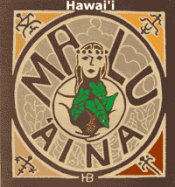 Malama Honua. Take care of Mother Earth and she will take care of us. POHAKULOA TRAINING AREA, Hawaii – Military Units are scheduled to conduct various training here in April that may be heard by surrounding communities. For the community’s awareness, the training is as follows. NOTE: The Army produces this monthly schedule to alert neighbors of upcoming training activities that are louder in nature and may be heard outside the military installation. This schedule is subject to change and may not include of all Army and Marine aviation/UAV activities, or Keamuku Maneuver Area (KMA). To receive Army training advisories directly, email eric.m.hamilton6.civ@mail.mil with “Subscribe Training” in the subject line. I talked by phone today (Tuesday, March 28, 2017) to both the West Hawaii Governor’s liaison, Susan Kim, and also Lt. Col. Charles Anthony, State of Hawaii Dept. of Defense Public Affairs officer. 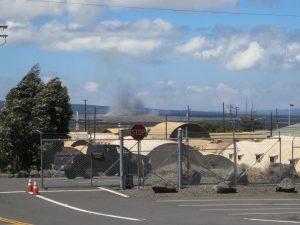 So it appears there will be live-fire at Pohakuloa on Wed but from artillery, not fighter jets. High explosive Live-fire desecrates the aina, burns DU metal creating DU oxide particles, and spreads DU oxide particles in the winds. Solidarity for protecting Pohakuloa and Stopping live-fire. 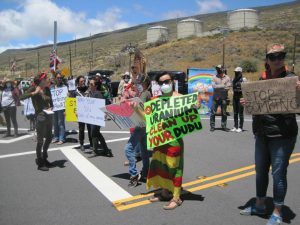 See you at the protest –Pohakuloa main gate Wednesday, March 29th 10AM-2PM.